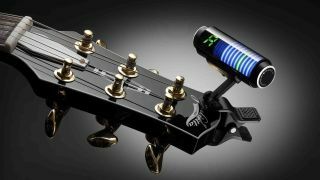 MUSIKMESSE 2016: We've said it before and we'll say it again: it just wouldn't be a trade show without a new Korg clip-on guitar tuner, and the Sledgehammer Custom 100 is the company's most luxurious yet. Part of Korg's new Custom Shop Series, the Sledgehammer Custom 100 offers a whopping 100 hours battery life using one AAA battery, as well as a new illuminated shuttle switch. Elsewhere, specs are in line with the rest of the Sledgehammer series, with a natty 3D visual meter, three meter display modes, auto power-off and +/-0.1-cent tuning accuracy. The Sledgehammer Custom 100 is available in black and limited-edition red and blue models from May for £46.80.